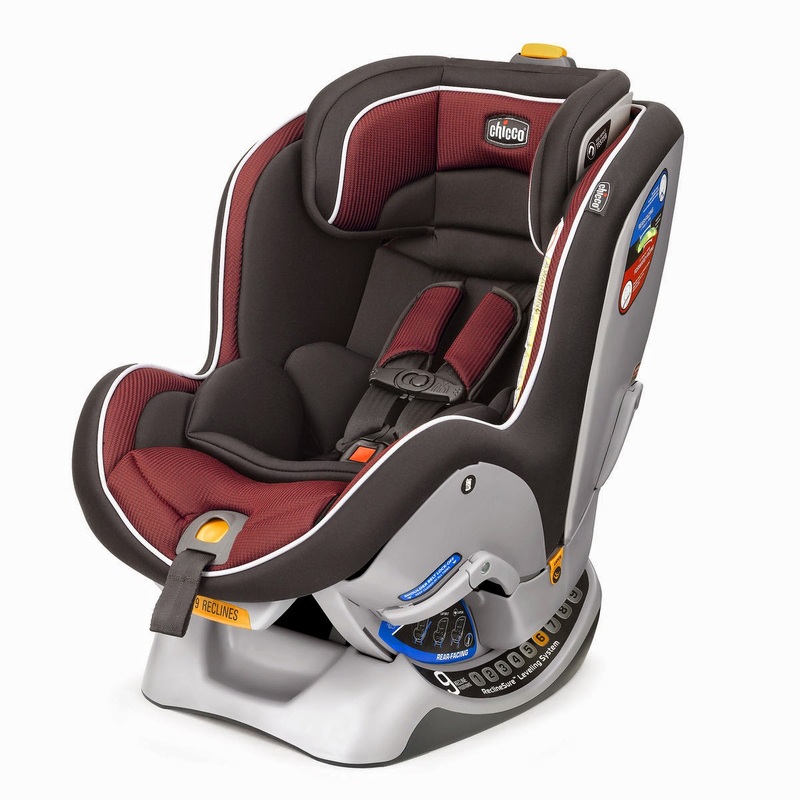 Introducing the NextFit Convertible Car Seat from Chicco, the makers of the #1-rated KeyFit! The NextFit is the easiest convertible car seat to install accurately and securely in a wide range of vehicles. Designed for rear-facing use from 5-40lbs AND forward-facing 22-65lbs. Chicco will be sending us a NextFit Convertible Car Seat to review! I am so excited to share our opinions on this beautiful Car Seat, in the meantime please enjoy some Tips from Chicco's Child Passenger Safety Advocate, Julie Prom. Keep your child rear-facing in their car seat until at least 2 years old, that’s right TWO years old. Are your kid’s feet touching the seat back? Do they look a little cramped? That’s OK! Kids are lot more flexible than adults. Kids need to stay rear-facing for as long as possible to protect their head and neck in the event of a crash. Kids are fragile, and they are best protected rear-facing, even if that means they have a little less leg room. To ensure a child can stay rear-facing as long as possible, purchase a convertible seat when your baby outgrows the infant seat. Worried baby will have a fit if he or she can’t see out the front window? Well, don’t. Too often, parents turn their child forward-facing too soon because their kids throw tantrums or seem bored. However, if your child’s never been forward-facing, they don’t know what they’re missing. Kids generally throw tantrums because they want to get out of the car, or they’re bored. Instead of putting them in danger and facing forward too early, bring car-friendly toys or snacks to keep your little one entertained. Parents often utilize the portability of infant car seats to help transport baby in and out of the house, to and from doctors’ appointments, while shopping and more, but it’s important to ensure the harness is properly buckled even when you’re not in a vehicle. It’s in the least expected moments that baby can squirm just enough, or someone walking by can accidentally bump into the car seat. Do NOT place a car seat on top of a shopping cart. We know, you see this every day in the grocery store, but it is a major safety risk! While it seems convenient, infant car seats are not designed to be secured to the top of shopping carts, and because the car seat is not properly attached, one bump could cause your infant car seat along with baby to topple off the top of the cart, or the weight from the car seat could cause the cart to tip over. Even when your child fits the height and weight guidelines to use a seat belt instead of a full harness with their booster seat, that doesn’t mean they should. Maturity matters - most children younger than 5-years old are not mature enough to sit without a full harness. You know your child best, don’t make the switch until you’re confident your growing child will sit still and safely without a full harness. Don’t buckle your child into a car seat with bulky clothing and add-on products like a car seat bunting. The added stuffing can interfere with the harness fit and crash performance of the seat. A good trick is to buckle your child in without his or her jacket and then put it back on backwards over the harness. It seems simple, but follow manufacturers’ instructions! All car seats must meet stringent Federal Motor Vehicle Safety Standard to be sold in the U.S. The problem is, 73% of child restraints are installed or used incorrectly. Always read and follow the instructions for each car seat you own – details can change from seat to seat. It’s also important to read your vehicle owner’s manual section on child restraints. This is great information, especially for brand new parents!! I know I was clueless when I brought my first one home. Car Seat safety is so important. First step is finding a great seat! Thisi one looks amazing! Knowing the right seat for your child, the right seat for your car, and how to install is so important. I'm a lapsed CPST. These tips would have come in really handy years ago when my kids were babies. I remember one time buying a new car seat and then crying in the Walmart parking because I didn't know how to fasten it,lol ! Mine are out of car seats these days, but my sister is expecting her first baby, I'll be sending her the link to your post so she can check out your great advice. Thanks for sharing! Great information. It looks easy but when you're a new parent it can be overwhelming trying to figure car seat safety out. I like that it has so many positions the base can hold the car seat in. I know I used to worry with my newborns that they were sitting too upright and they heads would flop over. I was so worried about their airflow. This looks great. Very good tips, this seems like a great seat and very high tech! Great car seat tips and reminders. So important to keep kids safe. Those are some great tips. It really does make a lot of sense to keep your child facing to the rear. Great advice! This is definitely something I will need to work on in the future! Follow the instructions...I bet so many people don't! such a great car seat. I love all chicco products. My 5-year-old just outgrew her booster not because she was too tall but her torso was too tall! Great information. It is so important to make sure that the car seats correctly.